A 41-year old woman whose name was Mary Kulele from Akwanga Local Government Area in Nasarawa state was caught at a hospital in Akwanga where she quietly went into the hospital pretending to be a nice woman by rendering selfless services to pregnant women. She confessed to taking the baby from the hospital ward when the mother took her clothes to somewhere in the hospital compound to wash. She was caught after a nurse raised an alarm over her suspicious presence in the hospital. Although the baby was recovered in good condition, the angry youths in the area took laws into their hands and lynched her. Despite her lengthy narration of her sympathetic life and marital experience, her plea for mercy and forgiveness fell on deaf ears as the youths smoked life out of her. She wailed and pleaded that her life be spared. She promised never to do it again but nobody came to her aid. It was for the want of a baby that would console her in her old age, after she was sent away from her matrimonial home on account of infertility, after 10 years of fruitless and frustrating marriage, that she lost her life. So sad! Really heart breaking... But stealing is not the way out.. She should have adopted a baby.. Deep sigh.. Nigerians are what is wrong with Nigeria. When will there be a law against Jungle Justice? Nigerian youths are jungle creatures. 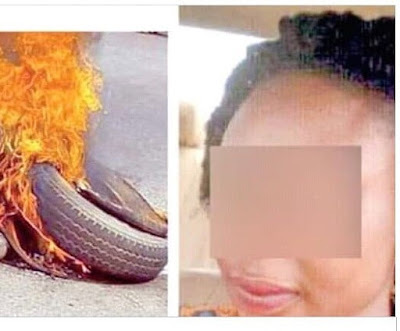 Some of those that burnt her are into yahoo fraud, robbery, thuggery, rituals etc. it is sad how people have lost humanity in the Nigerian societal space. The hospital authority shouldn't have let the youth take laws into their hands by killing her. I pray God have mercy on her. Amen Rest in peace madam. What exactly would the hospital have done? Its mot easy to adopt in Nigerian. Legal adoption in Nigeria is very difficult, takes longer years and requires a level of comfortable living before they can allow you adopt. Very few can afford and scale the criteria. It's not easy to adopt, but stealing a baby is easier? As in another woman gave birth to a whole baby, but would have left the hospital empty-handed cos a stranger that pretended to be nice came and took the baby? 1. NGOs and govt approved orphanages help to hasten the adoption process and put a good report/petition for the parent-to-be. You dont have to be 'so wealthy' to adopt if you are determined and serious. 2. If you look in your native community/village, there would be a pregnant girl roaming the streets because her poor parents are angry at the 'disgrace' she is bringing them, even when they dont have a plan for her life. Speak to middwives in such communities if you are a comfortable woman with medical records showing fertility issues and they will help persuade the girls to handover the child. In return, the person can help the girl get education to a certain level, or pay for her to learn a trade and set her up to start trading. All these would be agreed with the a midwife and the girl's parent or family head and traditional ruler (if any). When a community agrees to something based on cultural belief, it is not illegal. 3. I know someone who made friends with police at the nearest station, because of child-bearing issues. After sometime she opened up to them. She begged the police to help her with any abandoned baby they see. They checked her out and realised she was genuine. The next baby that was picked from the gutter by a bus conductor and brought to them, they called her up to come with clothes and food. They drove with her to social welfare, told them that she found and fed the baby that morning but she has no children of her own. And persuaded them to let her have the baby because they are tired of picking abandoned babies everyday. A few days back and forth with the child, she was allowed to sign off and own the baby. That child is 10 years old now and living well. I am stating these because statements like yours often discourage people from adoption. And you dont know who is reading. Your points are 100% valid @Chikito. What a sad story. Law enforcement agencies need to go after those behind this barbaric act. OMG!village have a hand in this and they have finally drank palmwine to celebrate her lynching. Irate mob couldn't even pity her a bit seeing that she's a woman. They should have just handed her over to the police. Jeez! Sad but didnt she think of the angush she would put another woman through? How about adoption? The horros of jungle justice tho. I dont want to imagine being surrounded by angry faces who nothing but blood would satisfy no matter what you say. Now this is truly heart breaking. OMG! This is incredibly sad. Sad that pressure drove her to act the way she did,sad that she had to lose her life in such a gruesome manner and sad that jungle justice is a harsh reality in our society. Is adoption not an option for goodness sake? Why the fear of stigmatization? There are many kids heck babies out there who desperately need love! the part she wailed begging for her life got me emotional. at the same time somone else would have been left broken losing a baby. if she wasnt caught, that urge of lynching her would have been justified cos of the high state of fury that will surface in ones mind. such inhumane treatment if necessary should only be for notorious and deadly vilans..
she wasnt given a 2nd chance. This is very barbaric but what I don't like is going to any extent to make yourself happy. You are going to make another woman sad, depressed and probably lose her mind cuz you want to be happy at all cost?? Not fair.Her baby would have just dissapeared with no trace?? Hmm that is a bit wicked. Stella, please do a post on adoption. Africans should embrace adoption, it is not a sin and you may still continue to try for a baby. There are a lot of children out there that need our love, care and attention. It is not a sin. May her soul rest in peace, very sad. There is nothing and shameful in adoption. Last year I went to an orphanage, I saw a week old baby, her mother died during childbirth and the father dropped her at the orphanage, there are many of her cases. Go there and make enquiries. Shame to the Father for dropping off that child at the orphanage. Nigerians and jungle justice. May God help us. We keep calling God, it has nothing to do with God. There are no laws or application of the law if there’s any. We are extremely barbaric and hypocritical. It’s a crazy place! Traders in the market that burn real and alleged thieves, is the market not their place of work? So sad may her soul rest in peace. There lot of babies in orphanages ,she should have gone to adopt one. Being TTC is horrible but stealing another person baby is wickedness.People re wicked,why will you intensionally inflict another person pains cuz you re TTC. Every body is screaming adoption adoption! Some of us here gossip people that adopt.and make them uncomfortable with your nonsense gossip. Thank God you said some!!! I am sure you are one of such persons that would gossip. Say no to jungle justice. That's why you should never mock people, who are ttc or become womb watchers for those who are married but no kids yet. Your 'good intentions' may be part of the pressures that push people to wrong decisions. Why not do the right thing chaii.. Say No to Jungle justice..this is really sad.. It's so bad that she was killed. She get mind sha!!! What if the mother of the baby had been TTC for years, then she managed to get one , only for storytelling to start. Na wa.